Bluefish synonymous with Istanbul has a privileged place in the city’s collective memory. It owes its unmatched image to its legendary abundance, delightful taste and challenging fishing. Like many Istanbulites, I was most looking forward to watching this documentary, Bluefish (Lüfer) for a long while. 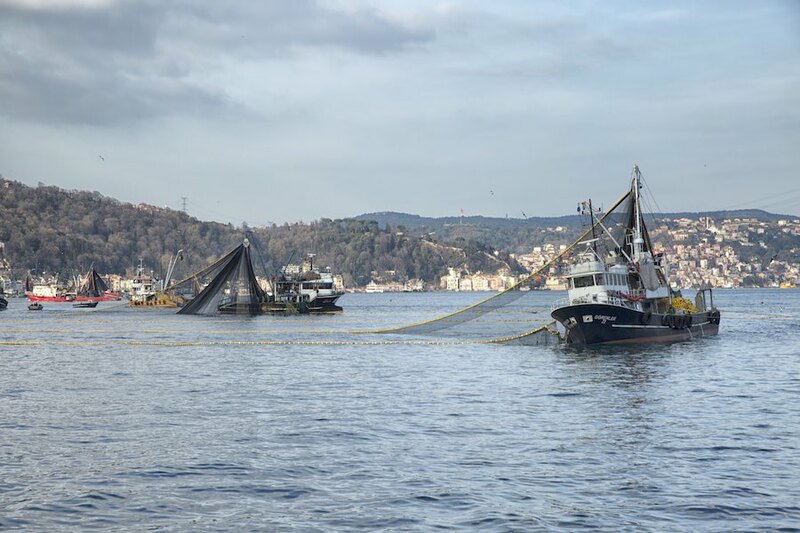 What the movie portrayed was a realistic and holistic picture of traditional and industrial fishing in Turkey, and Bosphorus as a biological corridor in regards to the city’s relationship with bluefish. Right after the screening, upon my request, Mert Gökalp, its director, agreed to have an interview about the documentary. 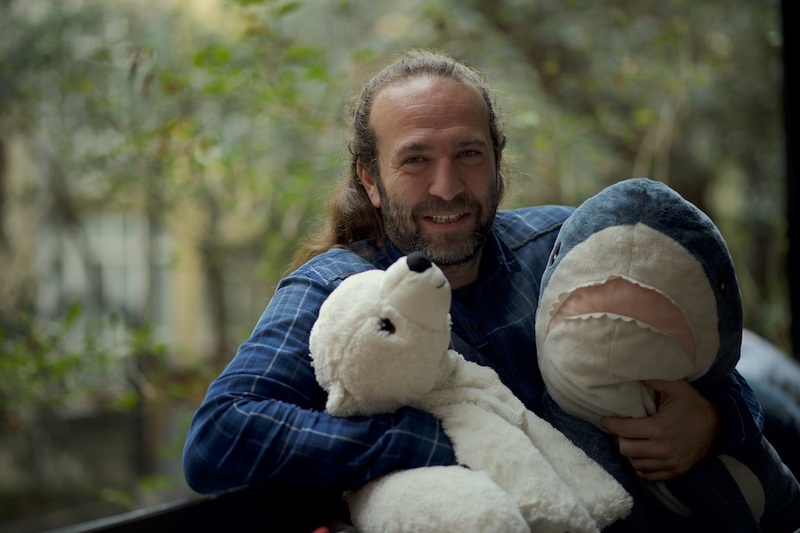 The first part of the interview focused on Istanbul’s complicated relationship with bluefish; whereas the second part elaborated the documentary’s production process. In the last part, we discussed projections on the future should the human interference continue at such a drastic scale. 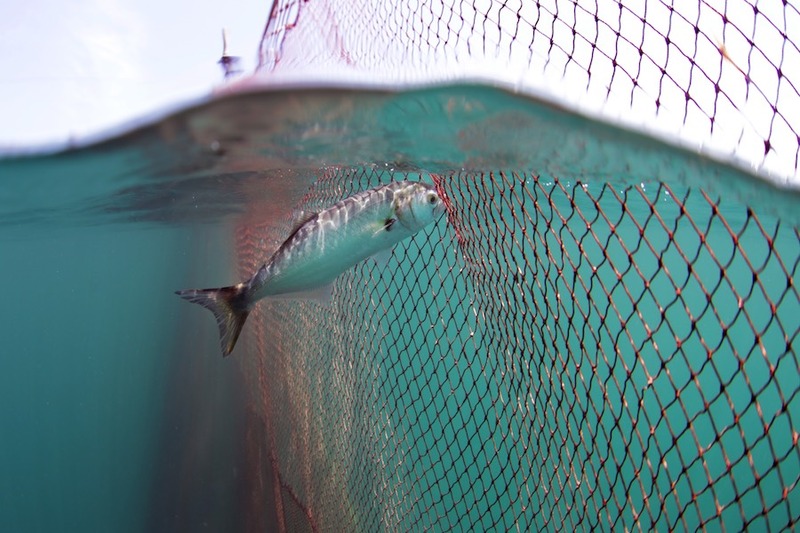 Are we going to let a fish we hold dear to our heart survive in our seas? If your definition of homeland is “the fish in the sea, the bird in the sky, the free flowing river, forests not set on fire regularly, and its peaceful habitants”, then watching this documentary is a must! I think I am a guide, who has become aware of the environmental problems, who cannot and does not want to exist in a capitalist world, who questions the connection of humans with the earth and their approach to nature, who finds the current approach wrong believing humans globally should reconstruct it, and who tries to interpret nature without unnecessary remarks. What is your background? What did you do until you made Bluefish documentary? As a matter of fact, I graduated from METU (Middle East Technical University) but as a result of my passion for the sea, I joined METU Underwater Association. I was an amateur in science, and after pursuing Master’s and Doctoral degrees, I ended up as a marine biologist. During the transition period, when I worked as an amateur photographer due to my interest in nature, arts and visuality, I found myself a professional photographer and cameraman, and later a director. 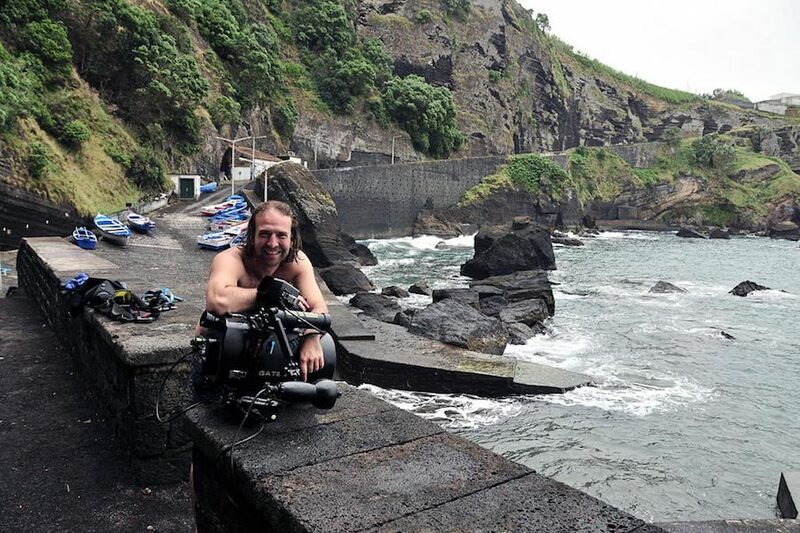 My love for the sea, photography, visuality, my scientific background, my experience as cameraman and director were all separate paths, which eventually converged into one. I first started with books. I worked on the Guidebook to Marine Life of Turkey and the Nature Guide. We also designed an application for the former, which we had to deactivate because people in Turkey are not very much interested in knowledge. It still is there. It did not sell as much as I expected so that I could keep on. Of course, it was a disappointment on my part. But, I realized if I could combine this with visuals, if I could explain my message on the screen, then we can reach out to a greater number of people. It was my childhood dream to make a documentary. This is the reason why the documentary we made is a good one: it has an analytic background, be it science, biology or engineering. How do you contribute to Magma magazine? What is your contribution to Magma magazine? For the past 2 years, I have been working as a free-lance writer and photographer for Magma. I write articles and news about the eco-system, marine life, communities shaped by the sea and environmental issues such as the climate change. The meticulous attention, respect, and care it pays to interpreting the planet, humans, nature, and wild life makes it the best magazine in Turkey. What kind of a fish is bluefish? It is actually one of the fishes I failed to shoot while I was preparing the Guide to Marine Life of Turkey simply because you need to be there at the right time. Back then, I was living in Bodrum, so that’s why I was able to shoot mostly in the south. Bluefish is always something we have held dear to our heart, much like bonito, small horse mackerel and anchovy. Yet, it has always been the apple of our eyes, the queen of our tables. We all feel very connected to it because of its taste. We were well aware of its legends but I delved into bluefish after I started this documentary. Traditional fishermen call it piranha as it is a very wild predator. Well, it is because it can eat its own species; it follows schools of fish like wild wolves; and it can attack fish as big as its size. Well, we call it the prince of the Bosphorus…? Yes, it was us who called it the prince to warm up the relationship between the fish and people. Some call it the sultan, some the prince. Some even call it ‘monster’! Everybody -be it the fisherman, or the harpooner- calls it a different name! Why do we call bluefish by 7-8 different names? We have given numerous names to bluefish, such as defne yaprağı, çinekop, sarıkanat (younger bluefish) and kofana, sırtıkara (larger blue fish). Which means its characteristics are embraced so much that we felt the need to give it different names. The situation creates such a dilemma now: the fishermen claim çinekop does not grow more than that. That’s not true, of course! We need to turn to science. Genetically, they are all the same fish but the thing is how Istanbulites identify themselves with it. This indicates a special relation, right? Absolutely! Everybody views it from a different angle. Those who eat bluefish appreciate its taste; those who hunt it appreciate its agility; the anglers its aggressiveness or the pleasure they drive from pulling it. Do the bigger bluefish (kofana, sırtıkara) still swim through the Bosphorus? They rarely go through the strait but again, they are caught very rarely. There are two scientific research carried out between the years 1956 and 2002. And there is one more research that we participated in in 2013. Its conclusions have not been published yet. The 1956 research states that the fish which is maximum 69cm tall is sırtıkara. The average 29 cm fish is precisely bluefish. In 2003, 50 years later, the second research states that the maximum length for the fish is 44cm. Which means kofana has reduced to 25 cm, and the average length for the fish is 14cm, which was çinekop. It has almost reduced to the length of defne yaprağı. This means kofana rarely swims through the Bosphorus, and the number of fish which reproduce has decreased in number. Kofana leaves more eggs. In the documentary, the fishermen claim sırtıkara, kofana are the one which cannot reproduce any longer. This is another misleading information. Why do they tell something like that? Because they cannot reproduce during some periods. But when they reproduce, they leave 2 million eggs. Çinekop, on the other hand, leaves 2000 eggs. This knowledge rests upon experience, which we need to respect, but this does not mean that we will believe everything they claim. Sometimes, they insist on their knowledge, which could be misleading. What would you say about the relationship of blue fish with the Bosphorus and Istanbulites? Bluefish makes a tough journey from the Aegean to the Black Sea, and then back to the Aegean. It struggles with the strong currents of the Bosphorus and the storms. It needs nourishment. It may be chased by many fishes and dolphins. There is nothing to romanticize about its relationship with Istanbulites; it is nothing but a war. We poison the route the fish go through, we cast nets, we hunt. We do anything to extinct the fish. We do not let any room for it to pass through. We do not let it reproduce. And finally with the fish traps, we pull it out with its eggs. We treat the ecosystem in the same way. We always prioritize humans. Istanbul’s relation with bluefish is all about eating. Very clear! Our love is all about eating, too. The way we view the whole ecosystem is not that different either. How should we interpret the bluefish images carved on the coins in the ancient period? We tried to explain this in the animation. Approximately 8,000-9,000 years ago, people came to inhabit the area around the Bosphorus, which we call Istanbul today. There are many reasons as to why they settled here: the abundance of fish in the sea and food on the land. The area stretching from Tekirdağ to İzmit, maybe further to Adapazarı, including the area further below, could be the most fertile land in the world, and we have squeezed 20 million people into this area. In the ancient period, starting from Aristo, many philosophers like Strabo, Homer, Oppian made it necessary to mention the abundance of fish, and their migration in their books; Aristo wrote about the history of animals; Oppian fishing. Catching fish with hand, or with a simple fishing rod, the frenzy that 3m long tuna fish as heavy as 1ton created while passing through the strait, the monstrous white sharks’ procession, 2-3m long sword fish, and bonito of course impressed them. How have we made use of this abundant area? We have squeezed 80% of Turkey’s industrialization into this area. And we are continuously poisoning, polluting and destroying the land. If it were not for industralisation, and dense population, if it were used for eco-tourism, it could have been the pearl of the Bosphorus. I believe we have not made use of this area efficiently. The same thing goes for the gulf and the Bosphorus. The ecosystem still struggles to survive. How did this fertile period end? Even though the fishing methods were basic, the abundance was clear. Evliya Çelebi, the Ottoman traveller of the 18th century, mentioned it in his book as well. Also, Fish and Fishing in Turkey, a book written by Karekin Deveciyan, the director of the Ottoman Fish Market Hall, is a reference book. Until its publishing, until the arrival of industrial fishing, until the 10-20 m long fishing boats were supported by our participation into NATO, until the fishing methods that do not match with this inner sea region, or any other sea were encouraged, the abundance continued. The internal migration, state policies, and the advance of technology were all effective in speeding up the process. Is bluefish the only fish we have lost all along? Unfortunately, it is not only bluefish. It is just a symbol. Long ago, it was tuna, and bonito. In the same manner like tuna, mackerel, club mackerel, bluefish, bonito and Black Sea turbot may completely disappear from the Bosphorus, the Marmara sea, the Black sea or recede from these regions. The documentary is meant to explain this threat. Does the bluefish belong only to the Bosphorus? Do we see it anywhere else? Not, at all. It inhabits Australia, some regions in the Atlantic Ocean, The Pacific Ocean, and the Americas, but it is not fished like it is here. Well, it is caught very rarely in Australia, America by hobby fishermen, and they are as big as 10 kg and 1m long (kofana, sırtıkara) but they are thrown back into the sea so that they live. This “catch and release” practice is not much known in Turkey. We catch all of them and do not release any. Probably, these kind of fish do not come to our seas; there is no research carried out on this. How did the bluefish campaigns start? We owe them to the campaigns by Defne Koryürek’s Fikir Sahibi Damaklar Slowfish such as “Do not let Istanbul crave for fish” “Bluefish Guards” “Bluefish Festival”, the slogans of GreenPeace Akdeniz and Banu Dökmecibaşı such as “How big is yours?” “No big fish if there is no small fish”, also the attempt to create sensation through chasing unlicensed troll boats with zodiac boats, the support of many journalists such as Gökhan Karakaş, Tan Morgül with their articles. The campaigns were quite successful and sympathetic, weren’t they? I think in the years between 2011 and 2012, an awareness for the situation was raised, which led many people to become aware of the problem. It made me think if this was really a serious threat, and start working on this documentary. Bluefish is considered to be the most delicious fish, which caused us to choose it for this documentary. It is actually the symbol of the sea.